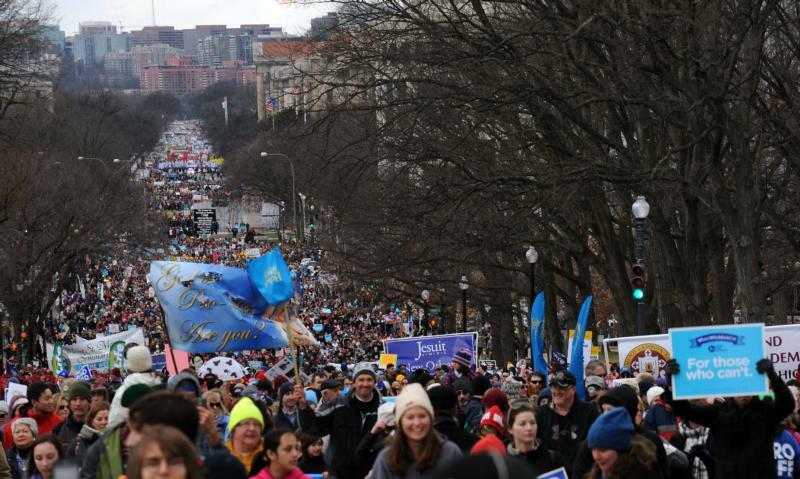 WASHINGTON (CNS) — Tens of thousands of pro-lifers filled the grounds near the Washington Monument and marched up Constitution Avenue to the U.S. Supreme Court Jan. 27 as both a protest of legalized abortion and a celebration of successful pro-life efforts across the country. In years past, the March for Life — which takes place on or near Jan. 22 to mark the U.S. Supreme Court’s 1973 decisions in Roe v. Wade and Doe v. Bolton that legalized abortion virtually on demand — has been almost a battle cry for the uphill and constant fight faced by those in the pro-life movement hoping for more abortion restrictions and ultimately an end to abortion. This year’s March for Life, under mostly sunny skies and 40-degree temperatures, was decidedly more upbeat, in part because one of the first speakers was Vice President Mike Pence: the first time a vice president attended the rally. Pence, who has marched at the event before as a participant and addressed it as a congressman, repeatedly told the crowd — huddled together in winter coats and hats in front of the stage — that “life is winning” and assured them the Trump administration was behind them. The scheduled presence of the vice president, only announced the day before, required the rally perimeter to be fenced in and the crowd to enter through long lines that had formed at security checks. Participants seemed unfazed by the required wait, taking it in stride with the day. Some pulled out their pre-packed lunches and started eating, others prayed the rosary. These marchers are used to plenty of hardships from weather conditions alone at the annual march. Jeanne Mancini, president of March for Life, noted that the group has been marching in all types of bad weather over the years. She also pointed out that amid recent discussion about crowd size at events in Washington, it was hard to measure the number of people that day or for the total who have come out for the annual march over the past four decades. “The only number we care about is the 58 million” lost to abortion since it was legalized, she said. As in years past, the crowd was primarily young, with a lot of high school and college-age groups. It was something the speakers took note of, saying this generation would not only keep the pro-life movement going but bring about changes. Mary Ann Vann, a retiree who made the trip from Trussville, Alabama, for her sixth march, said the most exciting thing for her each time she has taken part is seeing the young people. Vann, a parishioner at Holy Infant of Prague Parish in Trussville, said she hoped the energy at the march could be channeled into everyday support for the pro-life movement, something she is involved with on a regular basis with sidewalk counseling, volunteering at crisis pregnancy centers and helping young mothers with basic needs. She also said she is disheartened by hearing those who say pro-lifers are only concerned about babies because she and her fellow volunteers not only bring pregnant women to their doctor’s appointments but also help pay their medical costs. “You’re part of a pilgrimage. You take that experience home and you live it,” he added. Most in the crowd wore matching hats to keep together and chaperones were frequently counting hats to be sure they were all together. Although the crowd enthusiastically applauded Pence’s mention of Trump’s support, only a few of his presidential campaign’s red “Make America Great” hats were visible. Some noted that the march had a distinctly different tone than the Women’s March on Washington six days before. Two sisters who stood on the sidelines with some of the few handmade signs at the march, described themselves as feminists and said they found the pro-life march more positive and less angry. The city of Washington, fresh from the inauguration crowd and the women’s march held the next day, seemed prepared for this march. On the Metro, when two older women asked a young woman for directions and pointed to the group with signs that they wanted to join, the woman looked up from her phone and asked if there was a protest today.